Located on fabulous East Grand Traverse Bay, *Pinestead Reef-VIP* resort near Traverse City, MI provides you with instant access to Michigan's beautiful gold coast region. With over 700 feet of sugar sand beachfront property, Pinestead Reef is truly a vacationer's dream! Summertime guests can share a barbequed meal and lounge at the beachside tables at this family-friendly resort. In the wintertime, after a day of outdoor activities, warm up in front of the large, stone fireplace and sip a hot drink. Enjoy the indoor heated pool, sauna, and whirlpool/hot tub. 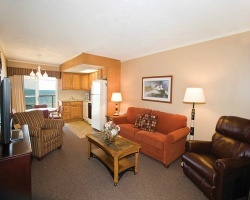 Guests can also utilize the onsite game room, exercise equipment and laundry facilities. Enjoy this private beachfront resort! Buyer May Receive A Title Fee Credit, Inquire For Details! Great week for enjoying the local skiing and snowmobiling just a few miles away! Make an offer today!